The Baltic Exchange was a building located at 24–28 St Mary Axe in the City of London and occupied by Baltic Exchange Ltd, a provider of information on maritime transportation markets. A historic landmark, the Baltic Exchange building was architecturally known for its cathedral-like trading hall and its stained glass war memorial. It was destroyed in a bombing in 1992. 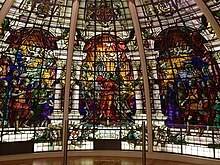 The site is now occupied by "The Gherkin"; the stained glass can be seen at the National Maritime Museum. The historic building was designed by Smith and Wimble and completed by George Trollope & Sons in 1903: it was subsequently listed as a Grade II* listed building. On 10 April 1992 at 9:20 pm, the façade of the Exchange's offices at 24–28 St Mary Axe was partially demolished, and the rest of the building was extensively damaged in a huge Provisional Irish Republican Army (IRA) bomb attack. The one-ton bomb killed three people whilst 91 were wounded. The bombing came a day after the General Election. Architectural conservationists wanted to reconstruct what remained from the bombing, as it was the last remaining exchange floor in the City of London. English Heritage, the government's statutory conservation adviser, and the City of London Corporation insisted that any redevelopment must restore the building's old façade onto St Mary Axe. Baltic Exchange, unable to afford such an expensive undertaking alone, sold the site to Trafalgar House in 1995. The remaining sculptures and masonry of the structurally unstable façade block on the site were photographed and dismantled before the sale; the interior of the Exchange Hall, which was regarded as stable, was initially sealed from the elements in the hope that it would be preserved in situ in any new development, but was subsequently dismantled and stored offsite in 1995–96. English Heritage later discovered that the damage was far more severe than they had previously thought. Accordingly, they stopped insisting on a full restoration. What remained of Exchange Hall was completely razed in 1998 with the permission of the planning minister John Prescott over the objections of architectural preservationists, including Save Britain's Heritage, who sought a judicial review of his decision. The site, together with that of the Chamber of Shipping at 30–32 St Mary Axe, was used to accommodate 30 St Mary Axe, commonly referred to as "The Gherkin". The stained glass of the Baltic Exchange war memorial, which had only suffered superficial damage in the bomb blast, has been restored and is in the National Maritime Museum. Its classic red granite, coloured marble, Portland stone, and much of the original plaster interiors that survived the bomb were first stored in a Reading warehouse before being sold in 2003 to salvage dealer Derek Davies, who moved them to Cheshire. Davies put the elements on SalvoWEB in February 2003, finally selling the 1,000 tonnes or more to salvage dealer Dennis Buggins in late 2005. Buggins then moved the elements from Cheshire to various barns around Canterbury in Kent. After years on the market, in June 2006 an Estonian businessman, Eerik-Niiles Kross, found an advertisement for the components of the Baltic Exchange building on SalvoWEB while trawling the web for reclaimed flooring. He and his business partner Heiti Hääl bought the Baltic Exchange elements for £800,000 from Dennis Buggins of Extreme Architecture, and the 49 containers were shipped via Felixstowe to Tallinn in June 2007. They vowed to rebuilt the building in central Tallinn like "Lego". The sold components include fifty crates with arches, staircases, marble columns, Britannia and others. Prior to its bombing in 1992, the Baltic Exchange building was used as one of the film locations for Howards End, released in 1992. The film was an adaptation of E. M. Forster's novel by the same name. ^ Schmidt, William E. (14 April 1992). "Dazed But Alive, Londoners Return - The New York Times". Nytimes.com. Retrieved 19 May 2018. ^ "30 St Mary Axe: The Gherkin". The Design Book. Retrieved 23 May 2017. ^ "Notes on the early history of the Practice" (PDF). Archived from the original (PDF) on 20 March 2012. Retrieved 10 August 2014. ^ "Trollope & Colls at the National Archives". nationalarchives.gov.uk. Retrieved 11 August 2014. ^ a b Lane, Megan (5 July 2007). "Extreme Restoration". BBC News. Retrieved 17 October 2013. ^ Oppenheimer, A. R. (2009). IRA: The Bombs and The Bullets. A History of Deadly Ingenuity. Irish Academic Press. p. 124. ISBN 978-0-7165-2895-1. ^ "Baltic Exchange bomb : London Remembers, Aiming to capture all memorials in London". Londonremembers.com. 4 October 1992. Retrieved 17 May 2018. ^ a b "'Gherkin' challenger gives way". The Telegraph. 14 October 2000. Retrieved 16 January 2016. ^ "Baltic Exchange Memorial Glass". National Maritime Museum. Retrieved 16 January 2016. ^ "Baltic Exchange sells to Estonia via Salvo Fair and a SalvoWEB ad - SalvoNews.com". Retrieved 16 January 2016. ^ Lane, Megan (5 July 2007). "UK | Magazine | Extreme restoration". BBC News. Retrieved 19 May 2018. ^ "Ajalooline börsihoone pannakse püsti ilmselt Ahtri tänavale". Eesti Päevaleht. 27 September 2010. Retrieved 16 January 2016. ^ "Face-to-face: The Story of the Baltic Exchange". Arhitektuurimuuseum.ee. 5 June 2016. Retrieved 19 May 2018. ^ "Howards End". Movie Locations. Retrieved 24 January 2016. This page was last edited on 6 January 2019, at 20:45 (UTC).